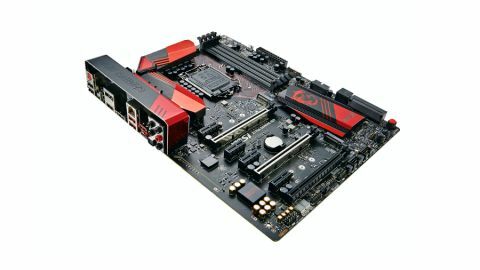 This high quality motherboard has plenty going for it, boasting a sterling feature set and aesthetics to match – though whether the outlay can be justified in performance terms is down to the individual. It's the question that just won't die. And MSI's new Z170A Gaming M7 is going to have to answer it. Is there any point in spending more on an upmarket motherboard? Not that the Gaming M7 is mega money. At £180 (around $280, or AU$380), it's far from the most expensive board you can buy that's based on Intel's new Z170 chipset. Not with mobos priced beyond £400 (around $625, or AU$850), like Gigabyte's bonkers GAZ170X-Gaming G1, it ain't. But it's still £50 more than two Asus efforts we've seen, and £20 pricier than MSI's own Z170A Gaming M5. So it'll need to sing that little bit louder for its supper. The good news is that, if aesthetics are near the top of your list, the M7 will be a winner well worth the extra wonga. It looks expensive. Part of that is the matte ﬁnish of the main PCB, which instantly separates it from the two Asus boards and their shiny cheapness. It's utterly superﬁcial, but subjectively, it's the difference between something that feels like an escapee from a south-east Asian sweatshop and a more premium product. Elsewhere, the LED debug display, power and reset switches, along with a knob for automated overclocking, add to the upscale vibe, as do the more generous component cooling and metal-clad PEG16 graphics slots. We can't help but notice the extra SATA Express port compared to the Asus boards, too. Irrelevant given SATA Express's DOA status? Probably. So, try this for size. The Gaming M7 has two M.2 slots. That's handy, and also raises the prospect of M.2 RAID arrays. Can you imagine the bandwidth bomb that could drop? We can. But sadly, imagining is all you can do, since this board doesn't support both M.2 slots running in PCIe mode at the same time. When installed, the second M.2 drive drops into SATA mode. Poo. While we're talking big bandwidth, you also get both USB 3.1 and USB Type-C support. Like with all Z170 mobos, the USB situation is complicated, with the back panel offering three USB 2.0 ports, two USB 3.0, a standard USB 3.1 port and a new-fangled USB 3.1 Type-C port. Phew! Elsewhere, you get the usual reﬁnements, including properly isolated audio circuitry and military class ﬁve components, including titanium chokes and support for both Nvidia SLI and AMD Crossﬁre multi-GPU graphics setups. Of all the added extras, then, it's arguably that Game Boost rotary knob that's most intriguing. The idea is you dial up the level of overclock you fancy, reboot, and, presto, easy idiot-proof overclocking up to 5GHz. It sounds ruddy marvellous, but in practice, it doesn't truly deliver. To cut a long story short, the highest overclock we achieved with our Core i7 6700K, using the Game Boost dial, was an unspectacular 4.2GHz. That's the same as the 6700K Turbo mode – pretty lame. The good news is that a quick trip into the BIOS will allow you to hit 4.7GHz with ease, which is as good as any other mobo will manage with this particular 6700K. The Gaming M7 also knocked out some very nice numbers in our stock-clocked benchmarks across the entire rendering, video encoding and gaming gambit. Compared to the cheaper Asus Z170-A that we reviewed, the results are very much the same – there's just a point difference here and there, save the last benchmark, which is actually four points shy of the Asus motherboard. The same overclocks were achieved on both boards.